HHG NewsHelping Hand Group has raised and donated $110,000,000! Helping Hand Group has raised and donated $110,000,000! 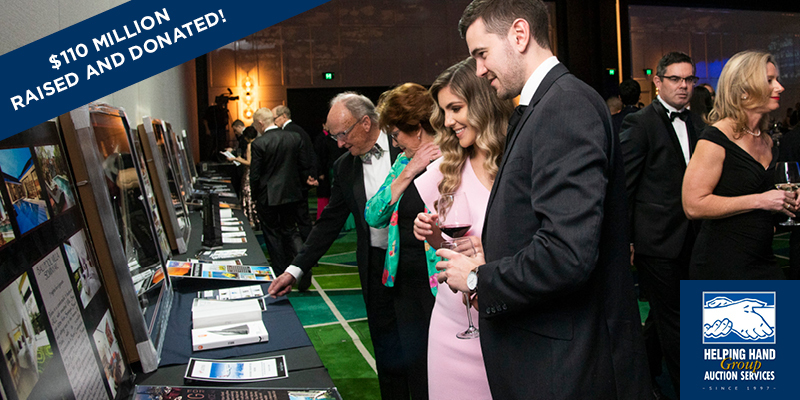 Our team is proud to announce that Helping Hand Group has hit a new milestone – $110 million raised by our fundraising silent and live auction services and fantastic range of auction items! Since 1997, Helping Hand Group has strived to provide the best fundraising auction solutions. Supported by experienced staff and outstanding auction items, our goal has been to excite event guests and promote auction bidding while taking the stress and workload off our clients’ plate. Our service has expanded over the past two decades to include the award-winning Last Donors Standing and the brand new $10,000 Golden Hand Paddle (read more about them here). These programs, along with our continuous sourcing of unique, bespoke auction items and friendly, experienced staff have been the key to running successful fundraising auctions. We look forward to many more years of hard work by helping our clients maximise their fundraising potential!